Fed Up: The Movie the Food Industry Doesn't Want You to See | Breezy Mama Breezy Mama - Expert parenting advice, celebrity interviews, product reviews for kids, moms and babies and more! In the late 90’s, we had some family friends visit us from Chile. They did all the touristy stuff, including driving to Vegas, walk Hollywood Boulevard and go to Disneyland. After their excursions, we sat and looked at their photos from their adventures. I vividly remember looking at picture after picture of my friends, when all of a sudden a picture popped up of an overweight stranger. “Why did you take this,” I asked. “Because the person was fat, we don’t see people like that in Chile,” was the answer. This scenario has always stuck with me. Visitors from out-of-country are taking pictures of overweight people because it’s something that they don’t see. It’s amazing, and a little un-nerving. And it’s a problem. 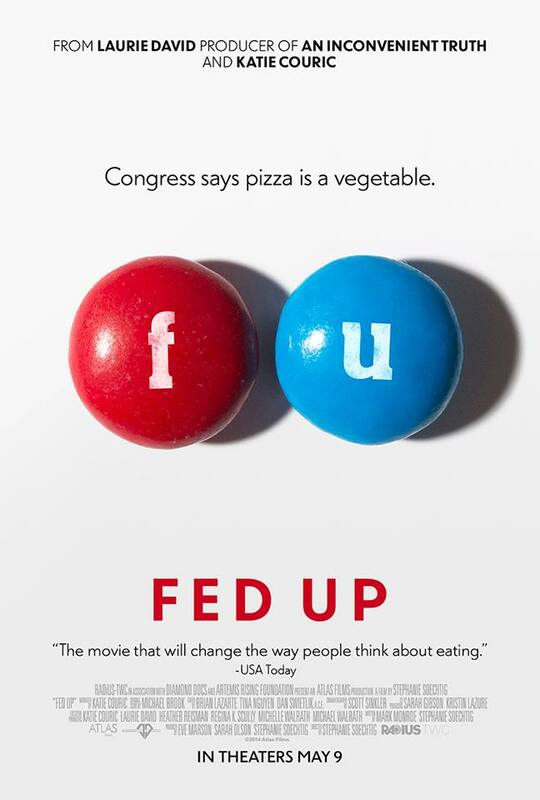 Fed Up, a movie which is coming to theaters this Friday, May 9, tackles these issues. Narrated and produced by Katie Couric, along with Laurie David, the film shows how the obesity rate has skyrocketed in the United States. More people are expected to die from obesity than starvation. Obesity is an epidemic; two out of three Americans are either overweight or obese. And who is it hitting the hardest? Our nation’s children. We’ve always heard the mantra, “Eat less and exercise more,” but for today’s obese children, this isn’t working. Take Maggie, a 12 year old who weighs 225 pounds. Maggie swims four days a week and walks her dog. She watches what she eats. But she can’t lose the weight. Why? Turns out because it’s the food that’s available to her. The food industry packages their products to seem “healthy” and made with “less fat”. What that means is that more sugar is added. Ideally, one should not consume more than 10 teaspoons of sugar per day. A 20-ounce bottle of soda contains the equivalent of approximately 17 teaspoons of sugar. Take that even further–one soda a day increases a child’s chance of obesity by 60%. You can see how this can easily spiral out of control—especially when dealing with children, who have a hard time saying no to soda, chips, candy, etc. The situation gets even more depressing when you take a look at what is being offered to children in their cafeterias. A few years ago, over 50% of school cafeterias were operated by fast food companies. Poor Maggie, and countless like her, have a hard time shedding the pounds when companies like Pepsi take over the lunch room. What’s being offered? Pizza Hut pizza (a Pepsi owned brand), french fries, chips—the situation got really bad when government agreed with a Minnesota based frozen food company (and huge supplier of cafeteria food) that yes, tomato sauce (pizza) is a vegetable. The situation is dire—the richest country in the world has placed private profit and special interests above public health. 30% of Americans are obese, and that number is expected to rise to 50% in the coming years. 1 out of 3 people will have Type 2 diabetes. For the first time ever, children are expected to have shorter life spans than their parents. Sad, depressing stuff. But, it can be turned around, and it’s easier than you think. Starting with actually cooking your food, instead of taking it out of a package. Watch the movie, learn more, and take action. The Fed Up website is filled with facts (most of them scary), tips, recipes, and much more—make sure to check it out. Jacqueline–it is so hard to stay away from sugar! Brady, a 15 year old obese boy who the film features, is shown looking at a box of Nature Valley (yes, Nature. . .) granola bars, and he reads, “30 grams of sugar!” Who would’ve thought? It’s in everything–cereals, bread, packaged rice, juice–it’s terrible. You have a big job cut out for you, and I will definitely cover the topic of Fructose Malabsorption, thanks for the idea. Yes! Especially when it’s the good, natural sugar found in fruits and vegetables (and of course at birthday parties and during the holidays! )… Thank you so much for being open to covering this! I am happy to talk to you when you get the chance to start the piece if you’d like. The more awareness out there, the more people will listen. Thank you, and Happy Mother’s Day!